The Gowanus Lounge: At Berry and Grand, It's...Another Karl Fischer!!! At Berry and Grand, It's...Another Karl Fischer!!! Somebody wake us up when it's over and Williamsburg has been renamed Fischerburg. 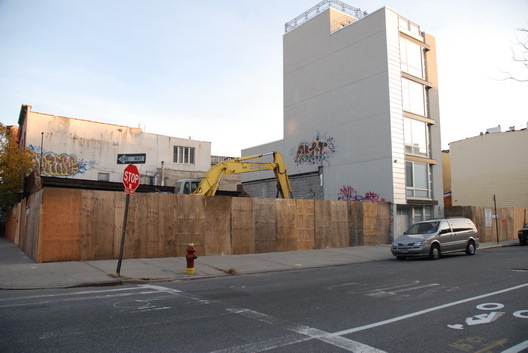 What you are looking at is the site of a new building that will be going up at Grand and Berry in Williamsburg Fischerburg. (Official addresses are 130 Grand and 259 Berry.) It will be 5 stories tall and have 22 units. We presume it will cover up the tagging that decorates the new building next door, around which it will be built. It should make like fun at the new building for many months to come. Speaking of which, there have been more than a dozen complaints so far during the demolition to the Department of Buildings. One of them was about the demolition being done mechanically and undermining the building next door. When the DOB inspected the site there was "no evidence of back hoe being used at time of inspection." We're not doubting this to have been the case. However, uh, that thing in the picture above, which was not "at the time of inspection" appears to us to indicate--perhaps...maybe--some evidence that mechanical equipment might have been used. Maybe. At some point. We think. That's a single family home in the picture, btw.